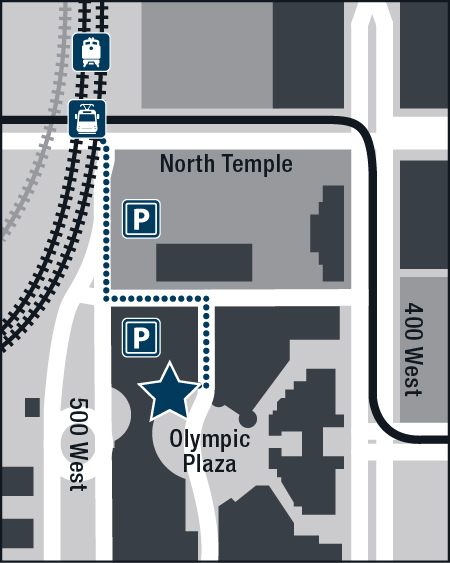 The Wasatch Front Regional Council’s (WFRC) office is located in the Cicero building at the north end of The Gateway, which is adjacent to the Olympic Plaza, and on the second floor. The second floor is accessed via the elevator or stairway, located in underground parking or on Rio Grande Street (adjacent to the Olympic Plaza). After exiting the elevator on the second floor, enter the brick building through the first door on the right. Proceed to the end of the hallway and WFRC’s office is located on the left. Take the eastbound 600 North exit. At 400 West turn right (south). At 50 North turn right (west). WFRC’s office is located in the Cicero building on the southwest corner of 50 North and Rio Grande Street. Take the eastbound 600 South exit. At 400 West turn left (north). At 50 North turn left (west). WFRC’s office is located in the Cicero building on the southwest corner of 50 North and Rio Grande Street. Underground parking is accessed on the south side of 50 North, just west of Rio Grande Street. Surface parking is accessed on the east side of 500 West, just north of 50 North. Validated parking is available for these lots. The office may be accessed via FrontRunner (North Temple Station), TRAX Green Line (North Temple Bridge/Guadalupe Station) or bus. Visit rideuta.com for maps and schedules. From the TRAX Station, descend the stairway to ground level and follow the directions from the FrontRunner Station. From the FrontRunner Station, walk south on 500 West. At 50 North turn left (east). WFRC’s office is located in the Cicero building on the southwest corner of 50 North and Rio Grande Street. Bicycle storage is available in WFRC’s office.